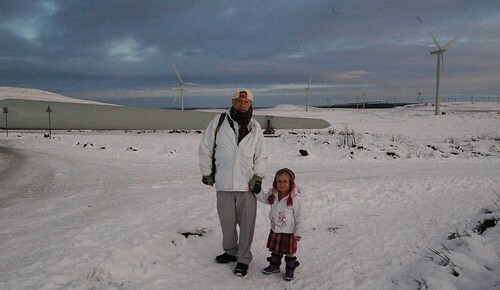 Dad and Anna at Whitelee, a photo by PhylB on Flickr. Dad had a scan on Anna's birthday (19/12/11). It was his first since the end of last spring. He had stopped one chemo regime in May and started a new one in July. Being moved from Hairmyres to the Beatson for a drug trial that was subsequently cancelled and then moved back, somehow resulted in his three month scan never materialising, so no one has had a look at his insides in about eight months. With Charlotte's birthday today, dad was told to come in for his results yesterday. He doesn't usually fare well on my kids' birthdays - having had his initial diagnosis on Léon's fifth birthday, and the last scan on Anna's (obviously I have too many kids!) Our hearts were in our mouths. He woke up to his tree on the lawn and phoned to tell me about it. I figured that had to be a good omen - he'd wanted rid of it so long. At lunchtime he phoned to say the results couldn't have been better! The tumour on his lungs had disappeared, as had the tumour on one of his kidneys. His other kidney and liver had shrunk since last May too and the original bowel one wasn't any worse! Why the hell couldn't the bastards have told him this three weeks ago! Not that I'm complaining really - it is definitely not what he seemed to be expecting - though as you can see from this photo (taken the week before Xmas) - he did look too well to me to be walking his final steps! Go dad! This is the best news we could have heard today (other than them finding a miracle cure, of course).